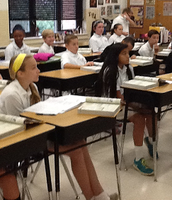 Sixth grade students reviewed that scripture is the inspired account of God’s relationship with man. In addition, students Identified examples of people in the Old Testament and their relationship with God. Seventh graders identified the two natures of Jesus Christ. Students made the connection that Jesus is both God and man, with two natures, divine and human, and He is the fulfillment of the promises of the Old Testament. 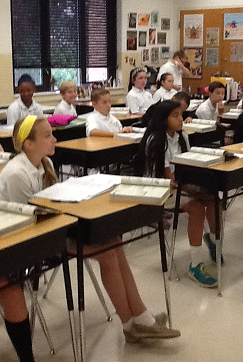 Eighth grade students named events when angels are mentioned in the scriptures, and listed the choir of angels. Eighth graders continue their preparation for Confirmation. The advanced math program has undergone a few minor changes. The program continues to provide additional challenges for students and further develop critical and creative thinking skills. In addition, advanced math retains the unit by unit nature of the program, offering many opportunities for students to access the program. It is a "pull-out" program, where students complete the same unit, one grade level higher. 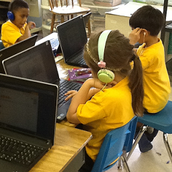 Eligibility to participate in the program is based on mastery of grade level material as demonstrated on the pretest, and students must be above grade level and regularly use Moby Max. The advanced writing program has undergone a major transformation. All students in grades 3-5 are invited to participate in advanced writing. The program supports our Traits writing program. Students will not be pulled out. 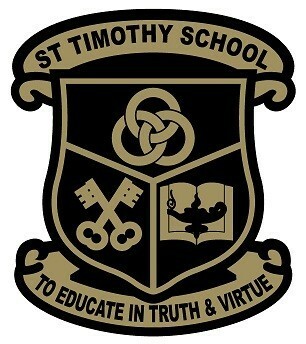 They will remain in their classrooms and are responsible for all the classwork and assignments. The advanced writing program is "in addition." Another important feature of the advanced writing program is the "all or nothing/no harm no foul" grading system: Students earn a 100 test grade for completing all activities with exemplary work. Students who start, but do not complete the activities are not penalized. Click the wikispaces sign-in below to access the writing wiki and all assignments. Students started the year off with multiplying and dividing decimals and moved on to describing patterns and working with variables and writing expressions. 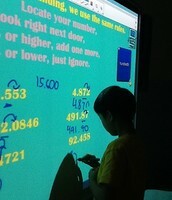 Students practiced substituting numbers for variables and worked on the word problem challenge. 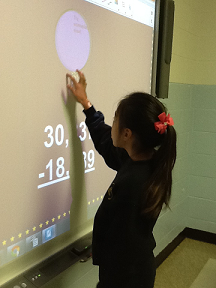 Students evaluated addition and subtraction expressions and then moved on to multiplication patterns and exponents. Sixth graders also gained an understanding of scientific notation and its uses, along with additional practice using decimals. Math 7 students reviewed all operations with integers and decimals, order of operations and working with data and creating excel spreadsheets. 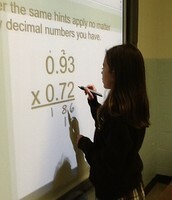 Students have been practicing with equations and inequalities and finding solution sets. 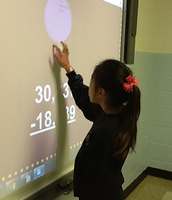 Students began the year working with integers and explained their understanding of adding and subtracting. Additionally, students identified quadrants and other terms associated with a coordinate plane. Pre-Algebra students moved on to solve one-step equations and inequalities, simplified expressions and combined like terms. 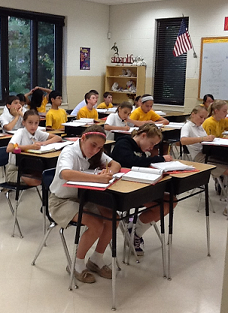 Eighth grade students began the year with rational numbers, adding and subtracting rational numbers. Additionally, students multiplied and divided rational numbers and simplified expressions with rational numbers. 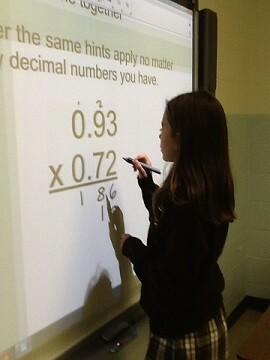 Students are also taking an in-depth look at exponents, including exponent laws. Students in Algebra reviewed whole numbers, integers, rational numbers and inequalities. Students focused on reciprocals and dividing real numbers and solving two-step equations. Geometry students began the year understanding postulates and theorems and the role Sherlock Holmes plays in backward reasoning used in proofs. Students researched and prepared oral reports on Geometers. Students have read and discussed a variety of pieces including, The Gold Cadillac, All Summer in a Day, King of Mazy May and All-American Slurp. Students discussed theme, made predictions, wrote newspaper articles, and dealt with characters in conflict. Seventh graders read Song of the Trees, Three Skeleton Key, Seventh Grade, and After Twenty Years. Students worked on vocabulary as well as literary elements of theme, point of view and character. Eighth grade students started off with Flowers for Algernon, A Retrieved Reformation, and Stop the Sun. Each selection emphasizes a particular literary element. Students analyzed the literature and drew conclusions relative to character, plot and theme. Students learned the importance of maps and the themes of geography. Additionally, students studied the Stone Age, including hunter gatherers and early farming, and continued on with the growth of early cities and first civilizations. 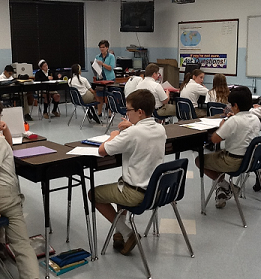 Seventh graders began their study of American History learning the history and culture of Native Americans. Following this, students analyzed the European need to explore and settle new territories. Students gained an understanding of the hardships faced by early settlers. Eighth graders continue their study of American History with a look at how settlers changed the west and affected the welfare of Native Americans. Students consider the impact of ranching and mining as well as the railroad. Students practice making introductions and polite forms of address, and began conjugating regular verbs. Students also practiced and recited the Prayer t o the Holy Spirit in Spanish. Students recite the Our Father in Spanish. Additionally, students practiced useful classroom phrases, numbers and weekdays as well as identified 21 Spanish speaking countries. Eighth graders recite the Our Father in Spanish and focus on Spanish grammar, including adjective agreement, and regular and irregular verb conjugations. Students also discuss plans, sequence of events and places and people they know. 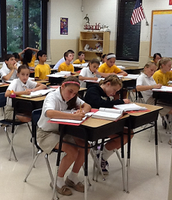 Sixth grade students began working on the Traits writing program. The trait of "ideas" was introduced first, and students used these skills in conjunction with writing and illustrating an Alphabet Book project and writing "explode-a-moment" essays. "Ideas" is the first trait introduced in seventh grade as well. Students combined the trait with the mode of expository/informational writing and began writing a survival guide for a natural disaster. Eighth grade students started the year off working on strong voice in their writing. Utilizing these skills, students are writing their three paragraph essay on What America Means to Me. Sixth grade students measured the volume and density of various substances, conducted solubility and miscibility tests and were introduced to the concept of pH. Students in 7th grade investigated factors that affect solubility, especially stirring. Students then conducted solubility experiments using hot and cold solvents and began preliminary work on the Science Fair. Eighth graders conducted boiling water and saltwater activities in which they compared commercially available thermometers with thermometers created in the lab. Students then completed freezing point depression Investigations and conducted boiling point elevation investigations. 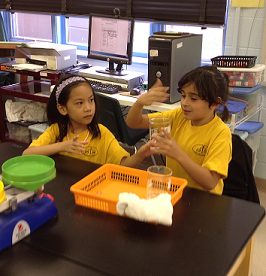 Additionally, students began discussing the Science Fair. Boys and girls in kindergarten have been sorting and classifying and extending patterns. In addition students worked on rhyming words and began working in their guided reading groups. Boys and girls wrote stories with beginning, middle and end, and discussed what writers do. First graders investigated the five senses, and conducted labs on good smell/bad smell. Boys and girls practiced reading and writing and "got caught using amazing words." Students also reviewed the features of a sentence and identified groups of words as sentences. Second graders solved problems with missing addends and solved problems with three addends. 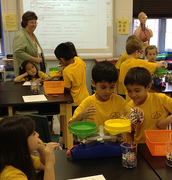 Students distinguished between command and telling sentences and conducted science experiments involving weight and volume. 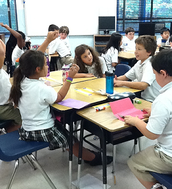 Boys and girls in third grade worked on revising and editing, and made connections between voice, organization and ideas. Additionally, students made a community collage and identified rural, suburban and urban communities. 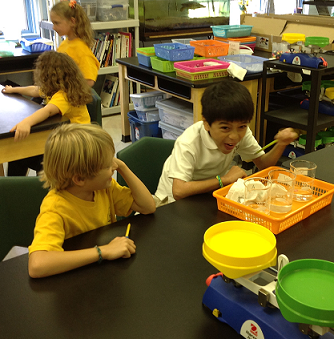 In math, boys and girls used addition to check subtraction and identified states of matter in science. Fourth graders used graphic organizers to connect voice, organization and ideas. In social studies, students discussed the characteristics of weather maps, physical maps and climate maps. In math, students added and subtracted two and three digit numbers, while in science students identified parts of the eye and became familiar with using microscopes. 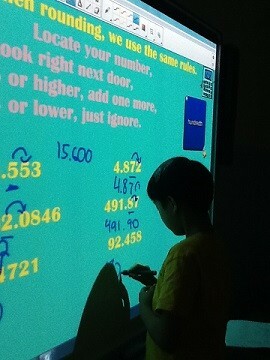 Students in fifth grade have worked on multiplying and dividing large numbers. Students also worked on geography, defining key terms and working on map skills. Additionally, students investigated simple machines and considered making pulleys from odd things.